Video posted on social media shows the man pulling the driver out of the car at a bank parking lot in Cupertino. A South Bay man will soon be honored as a hero for rescuing an almost unconscious driver from a burning car. Video posted on social media shows the man pulling the driver out of the car at a bank parking lot in Cupertino. New video from the bank's surveillance camera also shows the life-saving act. Some people who watched the vehicle catch fire called the scene surreal. Aram Harutyunyan, who was having lunch nearby, saw something else. He was able to see a glimpse of the driver slumped inside, obscured by the smoke. With the fire growing, Harutyunyan reaching into the Land Rover, pulled out the almost unconscious driver, and dragged the 200-plus pound man to safety. "I'm not sure if it was adrenaline or I was out of breath. I pulled him like about six feet maybe the first time," Harutyunyan said. "I was breathing very heavily. There is heat also that comes from the car. I could feel it on my face." Harutyunyan's friend also captured the heroics on video. Leo Pekker was shooting what he thought was an empty vehicle on fire and ended up recording his friend's brave act. "There was a lot of heat," Pekker said. "You just felt like it might blow up at any moment. I was worried about my friend, making sure he's OK."
Harutyunyan then told Pekker he was fine and made sure the victim was OK.
"We just put him on the curb, he was breathing and looked stable," Harutyunyan said. "Everything was OK. I just said 'Hey, you know, you're lucky.' and I just went to eat. And that's it." 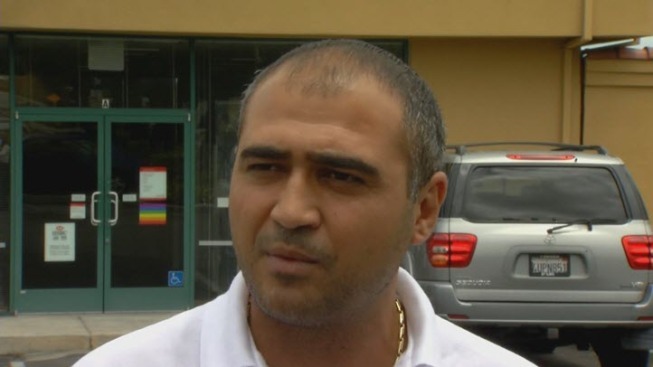 The Santa Clara County Sheriff's Office said it will be giving Haruyuntyan a Hero's Commendation. The driver, Aman Matoo, was arrested on suspicion of DUI and arson.